Ya Jagoff!!! | Are Turn Signals REALLY Optional? Home Driving Jagoffs Are Turn Signals REALLY Optional? Ya know when you’re sitting at an intersection waiting to pull out and another driver comes down the street perpendicular to you towards the intersection (like he’s gonna cross in front of you), so you decide to NOT to pull out, and then that driver turns BEFORE they get to you! Or, your driving behind someone yakin’ on their phone, they start to slow down, you have no idea why, they make a turn and THEN turn on their turn signal! You may say, “Big Deal,” or “Lighten up Francis!” it’s only a turn signal! Sure, this may seem petty but, not using a turn signal is more about laziness, selfishness and a lack of respect for others than anything else. Not using a turn signal because you’re trying to make the turn without putting down your phone AND your Sweet Tea is, well… ya know! 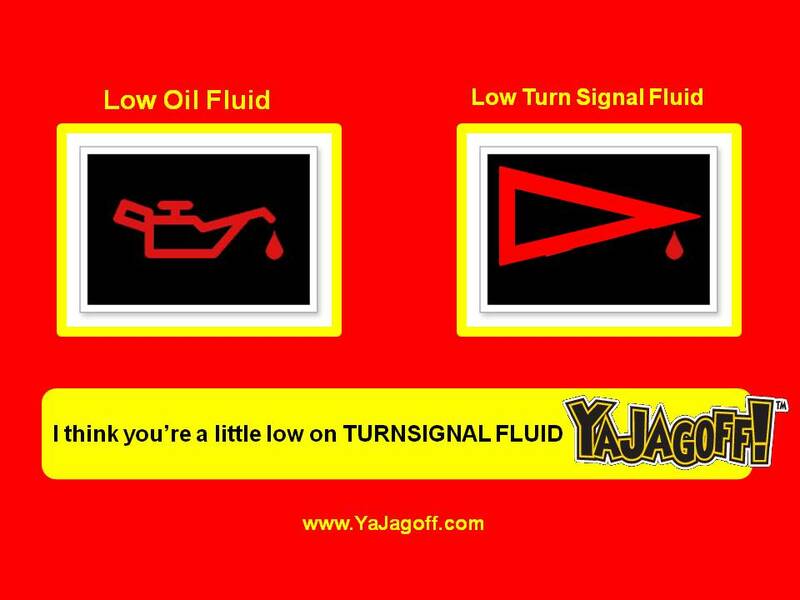 Hey Jagoff–my Great Carnack skills are a little slow today..signal B4 you turn! Haaaa.. we like the use of the vernacular Dr. Dave! But we think we found the problem, turns signals are failing because people are not replacing their TURN SIGNAL FLUID!! They can’t afford it, probably due to the economy, the war, the March hail storms and hurricanes, the recent G-20 Summit, the Batman Movie, the Tom Cruise movie activity AND gas prices!!!! We posted this note by Dr. Dave for two reasons: It made sense AND it’s still Breast Cancer Awareness Month and he would like you all to go LIKE the Young Women’s Breast Cancer Awarness Foundation Facebook page!!! Thanks for this one! Just had the same thing happen to me yesterday, an hour after buying my first car in almost ten years! I notice approx. 1 in 3 (jag-offs) on cell phones when they should be paying attention to the road! Is there not some type of ‘hands free’ system for drivers? I guess they figure it’s ‘optional’! LOL!